Carpet Cleaning Charlotte NC - Heaven's Best is always dry in one hour! Heaven’s Best Carpet Cleaning Charlotte NC offers carpet cleaning, rug cleaning, upholstery cleaning, and more! Our carpet cleaners give you the best value and we are confident that Heaven’s Best is the only carpet cleaning company you need. Call to talk to your local carpet cleaning technician to find out which cleaning service is best for you. They can answer your questions and schedule an appointment. If you are looking for Carpet Cleaning, don’t look any further than Heaven’s Best Carpet Cleaning Charlotte NC! A clean home is a heavenly home and Heaven’s Best Carpet Cleaning Charlotte NC will take care of all your home’s cleaning needs. Air Duct Cleaning, upholstery cleaning, professional tile and grout cleaning and sealing, and removal of any variety of stains created by pets or even those precious kids! We will do our best to fit you in for same day appointments and we guarantee that your carpets will be dry in one hour, every time! Our eco-friendly formula is safe for all family members, children, and pets alike. Check out our services page to see everything we offer. 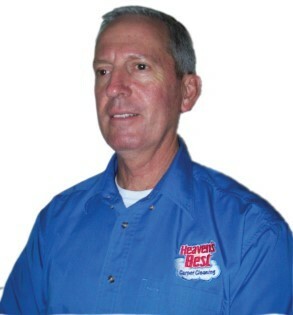 Greg & Lisa Humphrey are the proud owners and operators of the Heaven’s Best Carpet Cleaning Charlotte NC. We are natives of North Carolina and have lived here most of our lives. Greg has served in the military and is used to white glove inspections. We believe in being punctual, and in giving 100% on each and every cleaning. We will service carpet, hardwoods, tile & furniture just like it was our own! I've used Heaven's Best a couple of times now. They have been right on time, always polite, and I'm very happy with how they clean my carpet and furniture. The carpet looks great. Heaven's Best did a wonderful job. I just had Heaven's Best clean the carpet at my rental house. I had no idea it was possible to be cleaned. Wow! The carpet looks wonderful! . I was going to replace it, but not now! After moving in an older model house and and having a sick pet. You guys came out several times and were very proficient , professional and caring ....... just a week I used another Carpet cleaning company and my carpet was the worse ever ......:. Quality is quality... called u back and as usual u did good job! The owner/operator and staff have been professional and courteous on the numerous times that we have utilized their services. They have treated our home with respect, done superior cleaning and saved us money. Greg did a fantastic job cleaning our carpet, it looked so great after he was done we didn't want to walk on it even after it was dry. Greg was very friendly and punctual. We would definitely use Heaven's best again and recommend him to family and friends.